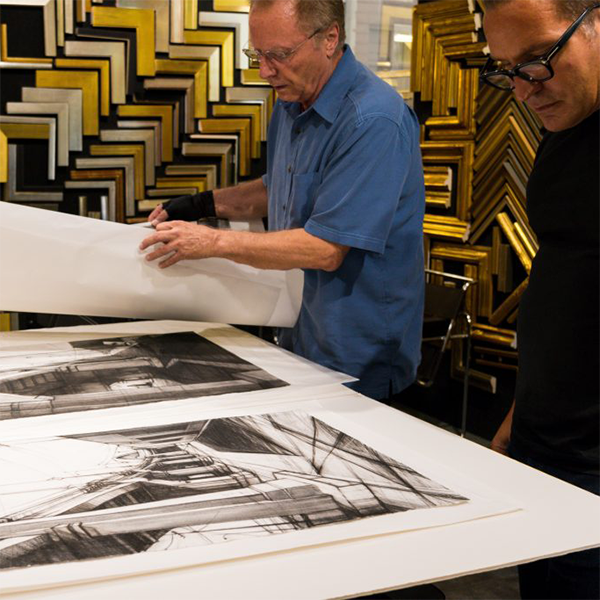 After 40 years and many thousands of custom frames, Kris and Rolf are excited to announce that we will be retiring from Framer's Workshop this summer. We have had the privilege of framing for you over the last 4 decades, some of you occasionally and some of you surprisingly often. A real joy for us has been working with you to design something special that you will get to enjoy every day. We have been able to to tempt you with some of the finest frames and frame makers in the world. 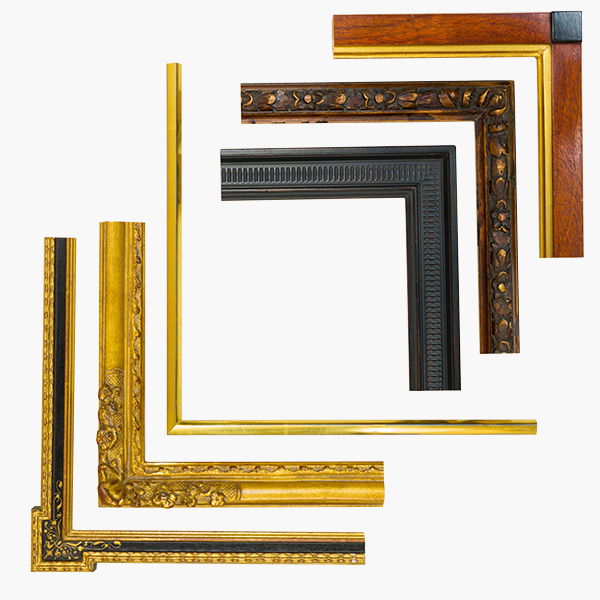 We have covered the gamut from contemporary hardwoods and the finest handmade, custom carved and gilded historical frames and even common moulding frames. Our matting and glazing options are the most complete available. We have brought you true custom frames, frames that are made to properly present and protect your artwork. Thank you for bringing us your most challenging projects and allowing us to frame some of the most beautiful and rare artwork and objects from around the world. We have always insisted on framing your art to high conservation and preservation standards. Our policy has always been to give more than is expected and to always protect your artwork. ﻿What tremendous fun we've had. 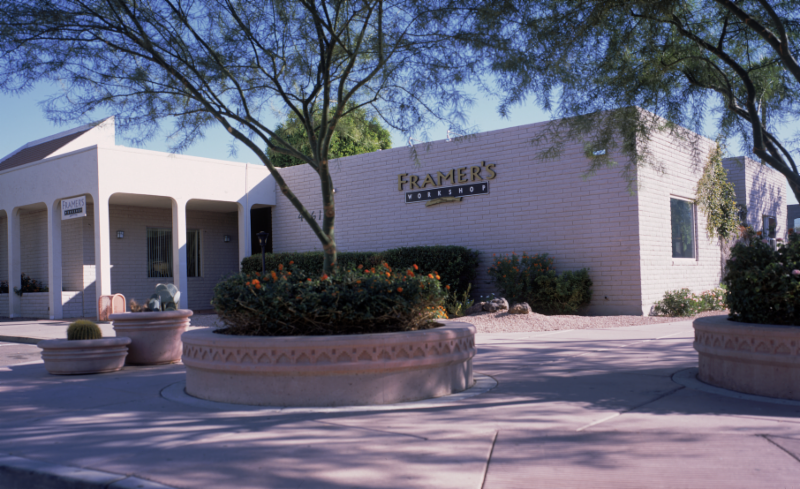 Framer's Workshop in Scottsdale will be closing its doors this summer. ﻿We were fortunate enough to purchase our building more than 20 years ago and now have sold it for development. I will be turning 69 later this year and Kris is 66, and we need to spend time enjoying our lives instead of working six days a week. Kris and I have lived frugally, saved and with the building sale are now able to retire comfortably. This will enable us to catch up on traveling and allow us to spend much more time with our daughter and our amazing grandchildren as well as chasing our many interests and passions. Unfortunately, we have no-one to leave Framers Workshop to, so we have decided to close the business and hopefully leave you with fond memories of working with us. We will be taking new orders until June 2, 2017. Everything brought in before that date will be completed. Our standards haven't changed, but the time remaining to get our frames and quality workmanship is short. May, 2018. Normal business hours and operations. June and July, 2018 . We will be completing all work in process and will make certain that it all gets picked up or delivered. July . We will finally get to frame some of our own things in addition to completing client work. We will contact all clients who have left or abandoned artwork, framed and unframed. After attempts to have all abandoned work picked up, we will auction the remaining items following Arizona rules for handling abandoned property. So, if you have left anything here, please pick it up now. JUNE AND JULY. Pickups of artwork will be by appointment . LATE JULY-Early August SPECIAL SALE OF PREMADE FINE FRAMES in various sizes. Perfect for artists who can make art to fit into an existing size frame. August, 2018 . Dismantle frame shop. Liquidate machinery and tools. Auction off all remaining items. Rolf and Kris sail off into great adventures. over the last 40 year s.
please understand that we will miss you much more. Thank you for our wonderful life! or stop in anytime. We would love to visit with you . Please link to our FACEBOOK page, and our TWITTER feed where I hope to add many pictures and stories about our time owning Framer's Workshop. Please comment or add anything that you would like to say about us. You could even share photos of the wonderful things that we have framed for you.